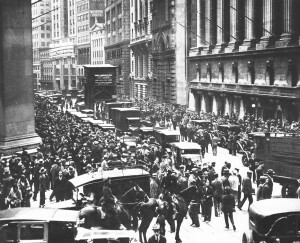 The House of Morgan or How the Great Depression was Created « CONSTABLE RESEARCH B.V.
Black Tuesday, October 29 1929 a giant economic implosion took place. This implosion was the official start of the Great Depression. The implosion took place because Something or Somebody was pushing the economy UP while it wanted to go down. An artificial Up-movement of the Economy is called a Bubble. J.P. Morgan was highly involved with the introduction of Fascism in Europe and the US. He believed that the major enemy in the World were the Communists. He was befriended with Mussolini and Hitler and organized a fascists putsch in the US by his own private army, the American Legion. The putsch failed. The legion was used as a recruiting base for the rebirth of the Ku Klux Klan. Morgan organized the US Communist Party to create an internal external enemy. Morgan used many other dirty tricks to accomplish his goals. The British Empire was the largest empire in human history. At the time of the Great Depression it controlled a quarter of the world’s population (458 million) and total land area. The ruling class of the Empire came out of old families and was trained in special institutions like Eton and Cambridge. The British Empire was based on the ideology of “Free trade”. “Free trade” was necessary to expand the markets of the British Factories. The factories needed raw materials, logistics and markets. When a country or a person blocked the free trade the British Army removed the obstacles. Free trade was organized in Trading Companies. They created strategic outposts. When the outposts controlled the region the British Management System (Law, Education) was implemented. The main goal of the System was to keep the natives under control, and to develop them slowly, and along their own lines. The British Elite was very practical. They were conservative men with relativistic notions about what forms of government suited peoples (or ‘races’) best. They didn’t go in for ideal systems. They also knew they did not have the numbers of personnel to try to revolutionize her subjects so they always used local collaborators. They practiced the method of “indirect rule”. The American Friends of the British Elite shared the commercial attitude of their British friends. They opened up new markets and protected their trade. They even invented a new tool, Financial Manipulation. In every other aspect they were very different. They were highly ideological and therefore not practical. They were convinced they were the carriers of the Best Ideology on Earth, Capitalism.Their first priority was to Destroy the Evil Empire and the friends of the Evil Empire, the Soviet Union. In contrary to their British friends they were not interested in indirect rule. When an enemy was destroyed they left the country and were convinced everybody would embrace their System. The Power of the House of Morgan was lessened by the New Deal of Eleanor Roosevelt in 1933. Roosevelt organized a Social Contract that gave more influencers the possibility to take part in the US Government. The Financial Power of Morgan never disappeared. His group is still behind many influential financial companies (Morgan Stanley, JPMorgan Chase) and institutions like the World Bank. JPMorgan is reincarnated in the person of Jamie Dimon (JPMorgan Chase). He is playing the same game as his predecessor and is behind many of the intelligent tricks that are now performed behind the scenes in Washington. The Economy was bubbling because the Government was “pumping” a huge amount of money into the economy. Therefore it was very easy to lend, to spend and to gamble with money on the stock-exchange. Many people gambled enormous amounts of money on the Stock-Market but on Black Tuesday they lost their bet. They lost their bet because suddenly nobody believed the Up-state would continue. Why was the US Government pumping so much money into the Economy? The strange thing happened that the major money pumping engine (the FRS) was controlled by the Government of the British Empire. The US Government was not involved. It was totally powerlesss.The British Empire needed money to maintain the backing of the British Pound (The Golden Standard) and the “old boys” network in the Financial Business just made a deal. The Government of the British Empire was controlled by an Elite. Lord Montagu Norman of the Bank of England and Benjamin Strong of the New York Federal Reserve Bank were of the same club. They arranged the Bubble. Behind the Elite was one Very Important Person, J.P. Morgan. He was the sole owner of a small company called the House of Morgan. The House of Morgan held effective control of the American government for much of the late nineteenth and early twentieth centuries. Morgan used the US central banking system to increase the ability to lend more money than he possessed. US Citizens paid taxes and their money was used to realize the plans of Morgan and his friends. Morgan helped his friends (including the Bush family(!)) to get rid of their huge debts and to “buy” many important US companies (AT&T, US Steel). After Black Tuesday the “friends of Morgan” held directorships in 167 industrial concerns, banks, railroads, and utilities. They controlled the most important media in the United States, including the New York Times. This entry was posted on Monday, December 10th, 2007 at 1:38 pm	and is filed under Completed, Economy, History, Not Started. You can follow any responses to this entry through the RSS 2.0 feed. You can leave a response, or trackback from your own site.